Starting a new quilt always feels like a gift. Choosing a pattern, selecting colors and fabrics, cutting into the cloth - these fresh possibilities create a sense of energy and even adventure. It's a gift I am grateful to give myself today. I have two new quilts that want to be born, but this one is coming first. It's first because it's simple. I need something restful and simple at the moment. Something that doesn't ask a lot of questions. So, I'm making a scrap quilt that focuses on my medium-sized scraps. It's all colors in! The design is based off this sketch, which was actually my first sketch for 30 Days of Quilt Design last fall. The concept of this quilt is so basic, but now I'm extra glad I took the time to record it. To begin I'm cutting scraps in standard widths, making piles of 3", 3.5", 4", 5" and 6" wide scraps. Cutting is actually among my favorite quilt-making steps. I particularly enjoy cutting scraps. All of the patterns and colors are a delightful rediscovery, like turning a corner and finding a friend. 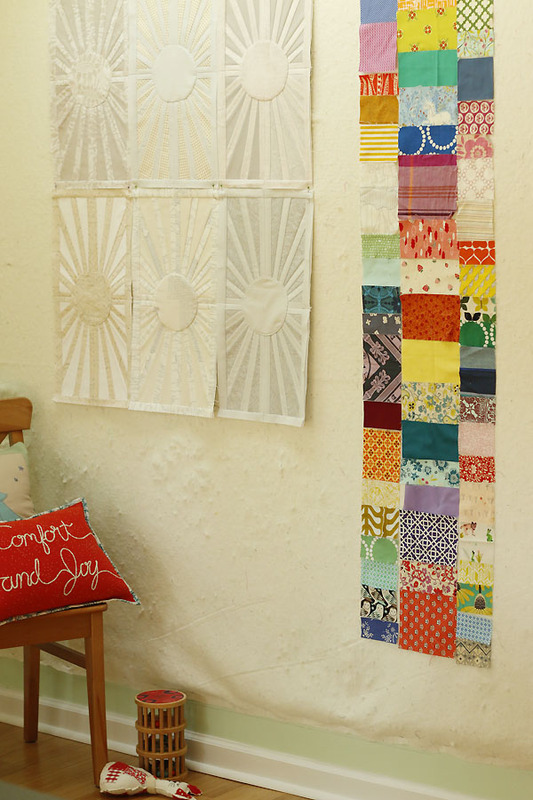 I've arranged a few columns on my design wall just to make sure I'm pleased with the quilt's direction. I am! And how boisterous is this rainbow beside those Facing East blocks! I have a lot more cutting to do, which I'll probably intersperse with sewing up columns here and there. A most welcome work indeed.